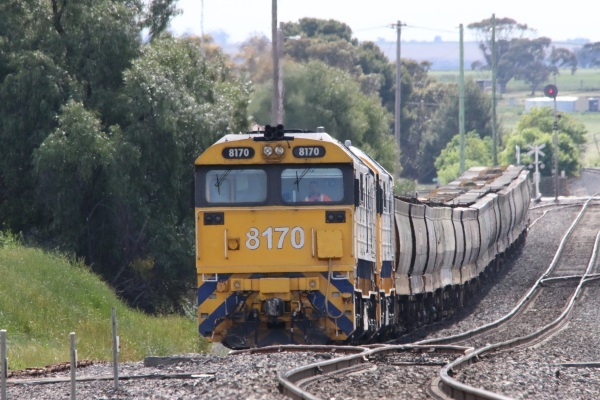 The Nhill grain receival site, which is operated by GrainCorp and is located on Belcher Street adjacent to ARTC’s Melbourne to Adelaide standard gauge railway line, will also be expanded after a number of proposed developments were approved the Hindmarsh Shire Council at their ordinary meeting in October. The application covers the construction of a grain handling facility including an in-ground road hopper, grain elevator, two 1,500 tonne silos, an over-road grain conveyor, two 100 tonne over-rail garner bins and the construction of a 1,600 metre long railway siding. The new siding and associated signals will be constructed within the rail corridor parallel to the main line. The Nhill receival site is one of only three operated by GrainCorp that are served by rail on the main line in the Wimmera region along with sites at Murtoa and Lillimur. Other significant grain receival sites on the line include the GrainFlow Centre at Dimboola and Viterra complex at Dooen. The current railway siding arrangement at the silo complex within the township of Nhill requires complex shunting movements to load a train due to the loop siding being on the south side of the main line, and the silos which are served by a switch back siding, are on the north side of the line. The move to the new siding will simplify the loading of trains and dramatically reduce the time required, which will bring this in line with the other similar facilities in the district, such as the GrainFlow Centre at Dimboola which can load a standard 40 hopper train in just over two hours. The current arrangement in Nhill has grain delivered and stored at the Belcher Street site, and the grain is then transported by road the two kilometres into the old silo complex in Whitehead Avenue in the centre of the town to be loaded onto rail. After these works have been complete, between 4,000 and 5,000 truck movements, that travel past the P-12 College, will be taken off the roads between the sites. One objection to this project was received which requested that issues relating to dust, noise, times of operation, light spill, and landscaping be addressed. Upon granting the permit for this project, the Hindmarsh Shire set a series of conditions, but is was considered that restricting operation to between 7 am and 10 pm as suggested was not appropriate as this may hinder the operation of the facility.